Karen Martin, president of the global consulting firm TKMG, Inc., is a leading authority on business performance and lean management. Known for her keen diagnostic skills and rapid-results approach, Karen and her team have worked with clients such as AT&T, Chevron, Epson, GlaxoSmithKline, Goodwill Industries, International Monetary Fund, Lenovo, Mayo Clinic, Prudential Insurance, Qualcomm, and the United States Department of Homeland Security to develop more efficient work systems, grow market share, solve business problems, and accelerate performance. 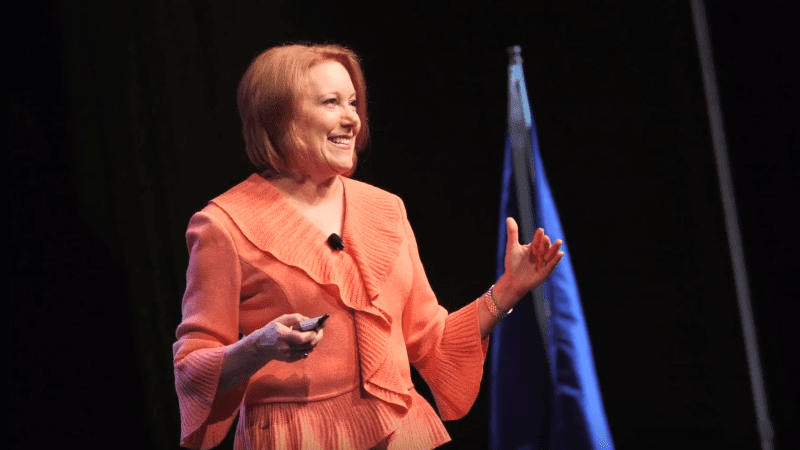 As a thought leader and skilled teacher, Karen has shaped how leaders and improvement professionals approach business performance in over 45 countries. Karen’s broad understanding of work system design and business management stems from her experience building and managing operations for several rapid-growth organizations that each grew into multi-billion-dollar companies. She developed a keen understanding of customer value while serving in sales and marketing roles, and has extensive experience mitigating legal and compliance constraints. While she has worked with clients in nearly every sector, her healthcare-rich background includes clinical, administrative, and regulatory work in hospitals, post-acute care settings, payer services, medical research, clinical laboratories, physician practices, integrative medicine and behavioral healthcare. Karen’s award-winning book, The Outstanding Organization, addresses the missing fundamentals that drive outstanding performance: Clarity, Focus, Discipline, and Engagement. Once instilled into an organization’s DNA, they open the door to sustainable growth and profit. Her latest book, Clarity First – a follow-up to The Outstanding Organization – reveals how to use clarity to unleash potential, innovate at higher levels, and solve problems more effectively. It’s her most provocative book to date and is garnering deep praise. Karen is also the co-author of Shingo Award-winning Value Stream Mapping, and two other books on business performance improvement. 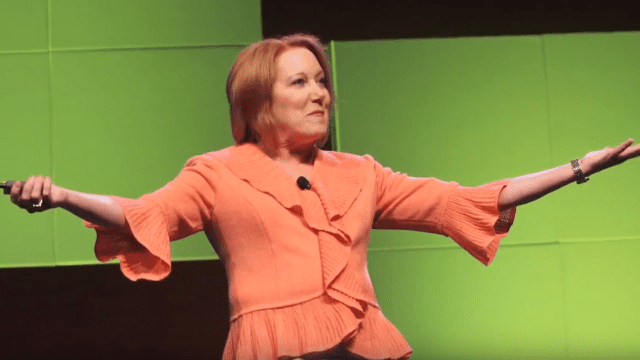 An in-demand global speaker, Karen wows her audiences with high-energy presentations containing practical takeaways. Audiences giving her high ratings have included groups such as MassMutual, Lenovo, Young Presidents’ Organization, Society for Human Resource Management, and the Association for Manufacturing Excellence. ~ Roger Greaves, Chairman, Health Net, Inc. 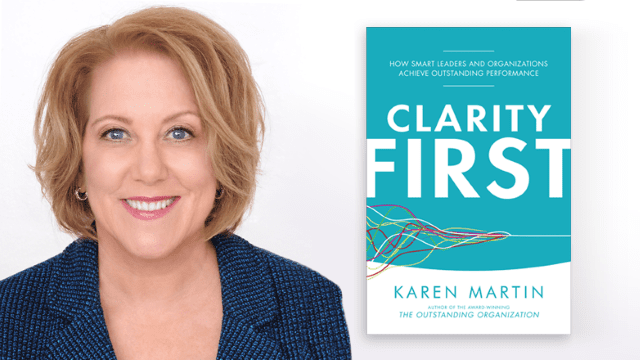 In Clarity First, Karen provides methods and insights for achieving clarity to unleash potential, innovate at higher levels, and solve the problems that matter to deliver outstanding business results. Eliminating ambiguity is the first step for leaders and organizations to achieve strategic goals. Learn how to gain the clarity needed to make better decisions, lead more effectively, and boost organizational performance. Karen is known for her keen diagnostic skills and rapid-results approach to meeting client needs. A skilled change agent, Karen builds energy within work teams by helping them focus an organization’s key performance goals—faster delivery of higher quality products and services at lower cost—while simultaneously building organization-wide problem-solving capabilities and boosting employee engagement. Karen Martin is a highly rated and engaging speaker. She informs her audiences with insights on how best to improve organizational performance and inspires them to create work environments that enable the entire workforce to excel. Audiences leave Karen’s sessions armed with practical how-to’s and motivated to carry out the urgent missions that Karen lays forth.